Dear Buyer! Thank you for choosing our Air Conditioner. Please read this HANDBOOK carefully prior to installing and keep it for further reference. Do not attempt to install, maintain the Air Conditioner by yourself. Incorrect installation or repair may cause fire, electric shock and damage of air conditioner. After purchasing of the air conditioner please contact your local authorized service center and place the order for installation of your air conditioner. Commit the installation or repairing of the air conditioner only to professionals. The manufacturer does not take any responsibility for damage if the air conditioner was installed or by unqualified specialists. 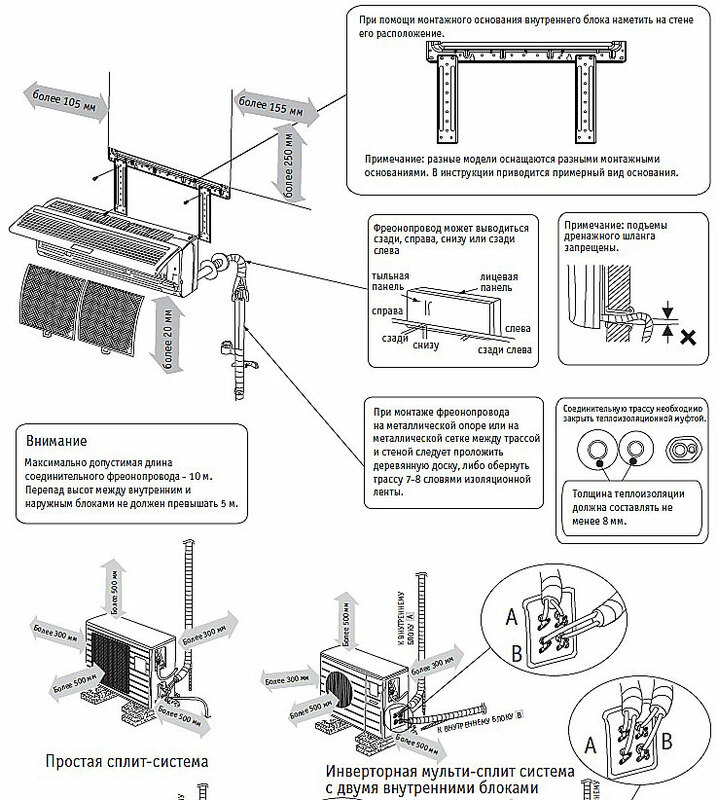 Confirm the installation position by the mark of the indoor mounting plate. The connecting pipe can be led from back, right, underside, or left-back side. Notice: do not raise the drain hose. The allowable length of the connecting pipe is 10m. The allowable distance between indoor unit and outdoor unit is 5m. Cover connecting pipe with adiabatic material. Sponge plastic adiabatic material with the thickness of 8mm. While installing the pipeline on the thin armor plate or on the wall of metal mesh, you should use the wooden board to clamp between the wall and the pipeline, or wrap up the pipeline with 7-8 layers of insulating plastic tape. Keep the air inlet and outlet at a far distance from the blockage. Keep the height distance between the indoor and outdoor unit at most 5m. Mount on the wall solid enough to bear the weight of the unit and not cause any shake. A place easy for condensate drain and easy for connecting with the outdoor unit. Keep a far distance away from the fluorescent lamp, it may influence the operation of remote controller. Keep at least 1 m away from the TV radio and other home appliances. A place for firm location of the unit, solid enough to bear the weight of the unit and not cause any shake. Good ventilation, less dust, far from direct rain and sunshine. A place where the air discharged out of the outdoor unit or the operation noise will not annoy your neighbours. No blockage near the outdoor unit. Avoid places close to inflammable gas leakage.